Photographers have a love / hate relationship with flash. On camera flash looks like crap, but as soon as we get the flash off camera, triggering it and getting good images seems to become an exercise in black magic. Oh I know, every manufacturer has a "wireless control system" usually based on infrared, which as we know is Latin for "doesn't work in the real world." Or only works for guys like Joe McNally. Radio controlled remote TTL is the answer for the rest of us, and now the very excellent Phottix systems are available in Canada from Henry's.Why radio? Because everything else is just painful. Canon added radio to their 600 EX-RT system, but it is Canon specific and only works with 600 EX-RT flashes, not exactly the most inexpensive route. Or you could go with the Pocket Wizard TTL systems. Or you could hammer nails into your eye sockets, similar outcome. Last fall I had an opportunity to get hands-on with the Phottix family of radio remote systems. I want to look at three different product families in this article. The Strato system sells for about $170 for a transmitter and a receiver. They are available for Canon and Nikon. You mount the transmitter in the hot shoe of your camera and put your TTL flash on a receiver. All your TTL settings are preserved and you have about 100m of range and don't have to be line of sight between them. The Strato system supports 4 distinct channels to prevent interference with other photographers. It uses the open 2.4GHz radio spectrum. Each unit runs on 2 AA batteries, so power is easy to find. The Strato supports High Speed Sync and Rear Curtain Sync. Phottix also includes a USB port for firmware updates. You want the functionality of off camera TTL and support for multiple flashes, but you also want to be able to group the remote flashes so you can set different power levels and different exposure compensations for the different groups. The Odin system supports three distinct groups, each group having its own unique settings for power level or exposure compensation, and you can mix groups with some being TTL, some manual. And you still have High Speed Sync and Rear Curtain Sync options. All units are firmware upgradeable. For about $450 you get an Odin controller and two Odin receivers. Each unit runs on 2 AA batteries and the range is about 100m. A similar kit from Pocket Wizard would be over $900 by the time you added the AC-3 Zone Controller. The LCD display is easy to understand, and the buttons are clearly labeled and you can get up to speed very quickly without having to raise the ghost of Alan Turing to decode the operations manual. 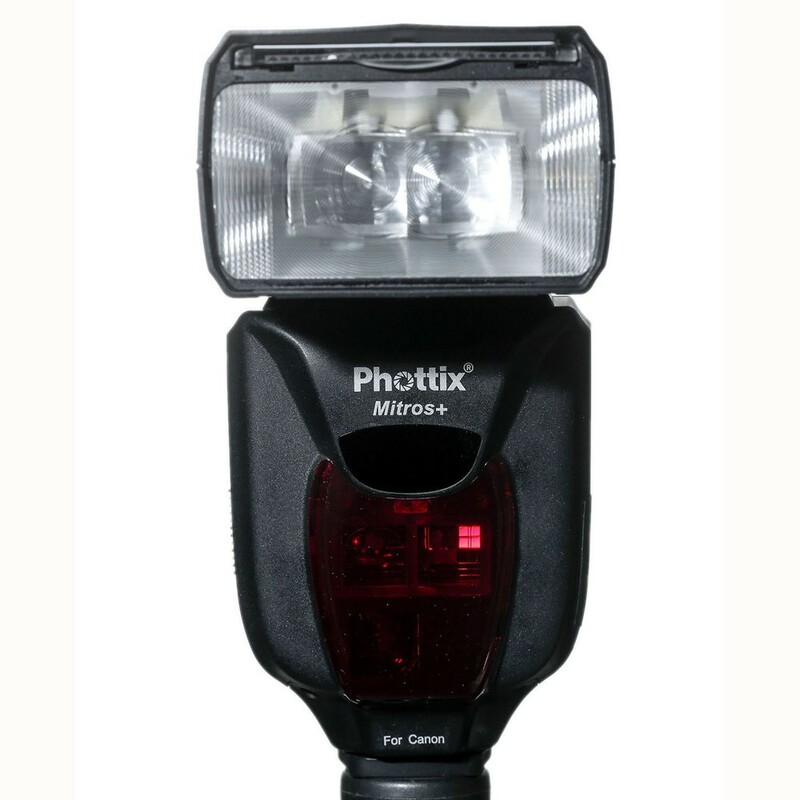 With the Mitros+ system, Phottix takes an Odin controller and adds a powerful bounce swivel flash head to the system. The Mitros+ has a guide number of 58 in meters, the same as the Canon 580 EX II or the Metz 58 AF. This is the closest third party system to the Canon proprietary 600 EX RT system. In fact the shoe lock is very similar to the sliding latch that Canon uses instead of the more common rotary wheels we see from other providers. Each flash can be a controller or receiver and also be a flash. You can put a Mitros+ in the hotshoe and not use the flash component, only using the controller to manage other Mitros+ flashes and Odin receivers. The Odin receivers handle multiple modes, so you can leverage existing flash investments and still control them remotely from the Mitros+. The flash has a zoom head with coverage from 24mm to 105mm. It also incorporates a full infrared system and can participate in Canon or Nikon infrared control systems depending on the model you own. Each flash comes in a padded case, and includes a threaded flash stand. The head has a pop out diffuser (spreads to 14mm coverage). There is also a clip on dome diffuser in the package. The Mitros+ can be used with external battery packs and also comes with a plug adapter for different power packs. The Mitros+ sells for around $470, typically $80 less than the similar Canon 600 EX-RT. The construction of the products feels solid with quality plastics in the housings. The feet are metal, not plastic, so will be a more stable platform and less likely get snapped off. I liked that the needed cables are in the boxes, including USB cables for firmware updates, PC cables and the proper 3.5mm connection cables where needed. While you can make flash images with only a single off camera flash, to get to more sophisticated setups, most photographers are looking at three speed lights with an on camera controller. Infrared can work ok indoors so long as everything is line of sight and pretty close but infrared falls apart outdoors if you look at it funny. For serious multi-speed light setups, radio transmission is the only way to go. While there are photographers who swear off TTL or behave as if using TTL is some form of cheating, the Magical Unicorn of Flash, the great Joe McNally advocates TTL and calls it an excellent place to start to get to the shooting faster. By being able to modify power levels without having to run from flash to flash and to not have to worry about line of sight, radio drops the stress level and increases the success probability and the reduces the need to perform some kind of blood sacrifice to get your lights working. I like that the Phottix systems specifically support high speed sync as well as second curtain sync. Canon's own off camera system doesn't even support second curtain sync. You want off camera flash. You want remote control. You want it to work effectively. Phottix radio systems will help make that happen. Please note however that the Phottix radio system, like others, does not interoperate with Canon's proprietary implementation. That would be an added bonus.